This type of space is what most people imagine when they picture a typical “artist’s loft.” A live/with™ unit is typically a single space, including a kitchen located below a mezzanine/sleeping space, which looks out over a large contiguous working space. This arrangement offers the greatest flexibility and the fewest interior partitions, allowing the user to adapt it to many different configurations. 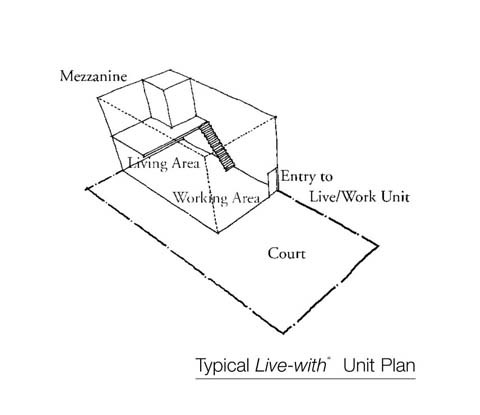 The amount of space devoted to the “live” area and the “work” area depends on the occupant’s needs at the moment, and will likely vary over time as a result. Live-Near™ meets the needs of those who feel that the proximity afforded by live/work is important, but who would nevertheless would like some separation between living and working spaces. This can be to minimize exposure to hazardous materials or high-impact work activity, out of consideration for family or roommate, or simply to fill the need for the bit of distance created by a wall or floor. 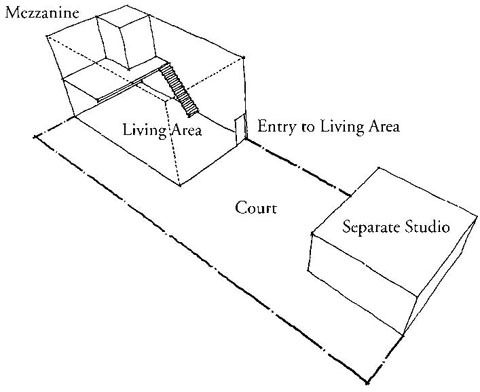 In a live-near™ unit, the living portion may more closely resemble an apartment or townhouse. 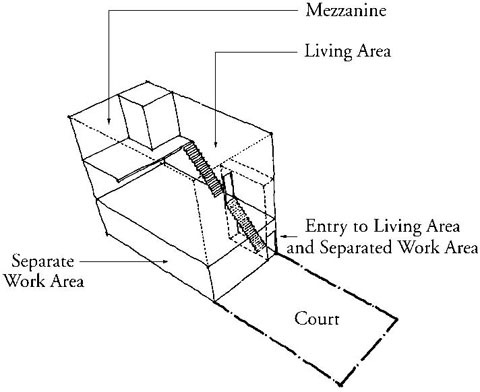 The work space is separated by a wall (sometimes glazed and sometimes fire rated) or a floor. In this configuration, a short walk separates the living portion and the work space– across a courtyard, to a converted garage or other accessory structure, or up or down an exterior staircase, for example. While this type may initially appear to be simply mixed use, classification as live/work may permit its existence in places where a residential or a commercial space alone might not be permitted.